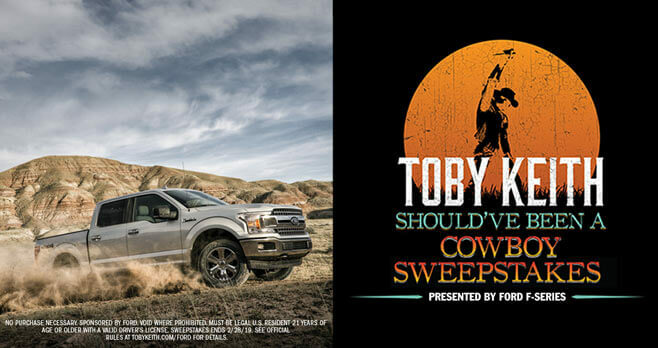 Visit tobykeith.com/ford and register now for the Toby Keith Should’ve Been A Cowboy Sweepstakes. You could drive home your choice of a new Ford truck plus, a VIP experience in Las Vegas for you and a guest, curated by Toby Keith. Prize: The Grand Prize consists of winner’s choice of a 2019 Ford Truck and an exclusive trip for two to Las Vegas, NV in April of 2019. Eligibility: The Toby Keith Should’ve Been A Cowboy Sweepstakes is open only to legal residents of the 50 United States and District of Columbia (U.S.) who are at least 21 years of age as of date of entry, with a valid driver’s license.